Richard Walker has just died, and his family is soon to arrive to start making the final arrangements for his funeral and for the sale of his empty home. Richard Walker’s family is not aware that Richard Walker’s home is not empty at all: It is the home of two ghosts, Alice and Sandra. Ghosts, as we know from the horror movies marathons from our youth, have reasons for their hauntings. They have baggage, and that baggage holds them back from leaving for the great beyond. Richard Walker’s family arrive: his ex-wife Caroline, troubled son Trenton, and unforgiving daughter Minna. Turns out, the living have their own share of baggage, and that baggage can hold them back from truly living their lives. As Caroline, Trenton, and Minna start to slough through all of Richard’s left behind stuff, they are forced to confront their own issues and unanswered questions. Watching it all, Alice and Sandra are confronting a few issues of their own. At the heart, this is a book about forgiveness and letting go. 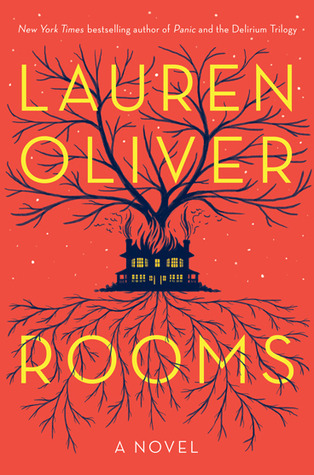 “Rooms” gives us a glimpse into the hearts of both the living and the ghosts of the dead, as they all struggle with accepting their lives as they played out. An enjoyable read, simply because of the interesting telling. Perhaps, with this title, there were too many voices telling their tales, for I found I wasn’t terribly invested in any of them by the end. However, that might have been the point…to give us a larger view of these individual lives. And in providing such a view, the author succeeded very well.